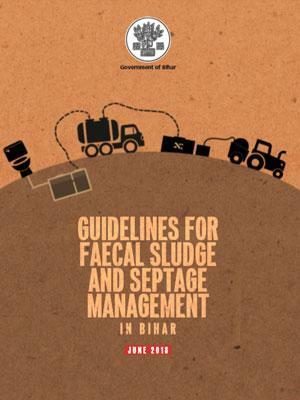 The draft FSSM guidelines are prepared by CSE on request from Deptt of UD & HD Bihar as part of technical support on mainstreaming citywide sanitation and effective Septage Management in town/cities of Bihar. In addition, CSE is supporting 4 flagship city’s in Bihar namely - Buxar, Katihar, Muzaffarpur and Bodhgaya in journey beyond ODF as envisaged unde SBM ( Urban) for target town/ cities. We will also develop model City Sanitation Plans for Bodhgaya in Bihar ( and Bijnore in U.P) to provide a framework for town and cities in planning for sustainable citywide sanitation. According to Census 2011, Bihar reported 11.67 million urban population i.e. 11.25% of total population of state living in 199 urban centers (which accounts 3.14% of total urban population of country). The state has 143 statutory towns and 56 census towns. The state has 143 urban local bodies (ULBs) including 12 Municipal Corporations (Nagar Nigam), 46 Nagar PalikaParishads and 85 Gram Panchayats. State ULBs with limited local resources and state support is responsible for provision of municipal services. A sanitation snapshot of urban Bihardepicts that in the state, households with septic tank based sanitation systems (52.72%) far exceed those with sewer connections (7.21%). In 2016, Chief Minister of Bihar launched a SaatNischayYojna (CM’s Seven Resolves), a campaign which delves towards holistic development of the state on 7 main issues. Two of the seven issues focused on sanitation service: 1. Coverage of access to toilets to improve sanitation facilities and be open defecation free. The scheme provides an outlay of INR 28,700 crore (USD 4.315 billion) to construct 1.72 lakh crore (1.72 billion) toilets in the state. 2. Provision of lined drains to the households and roads with an outlay of INR 78,000 crore (USD 11.73 billion). Under this scheme the state government has created its baseline data by means of collection of data of toilet interface facility, type of toilet, containment at site, availability or water and other subheads as per the 7 main issues. Under Atal Mission for Rejuvenation and Urban Transformation (AMRUT), Bihar State Annual Action Plan (SAAP) for FY: 2016 -17, reported that 23 out of 27 AMRUT cities have prepared CSPs and DPRs for water supply and/or sewerage and storm water drainage. According to State Annual Action Plan (SAAP) 2016-17, the sewerage and sanitation in Municipal Corporation andNagar PalikaParishads is not a priority of the state, despite huge gap in the demand and supply. Most of the funding is allocated to achieve 100% water supply, which will further increase this massive gap in terms of network coverage. There is only one project proposed on septage management in Katihar city. In addition, two Nagar Nigams namely Muzaffarpur and Katihar along with Buxar Nagar PalikaParishad and Bodhgaya Nagar Panchayat are being supported by Centre for Science and Environment (CSE) in preparing City Sanitation Plan mainstreaming effective Faecal Sludge &Septage Management Plan. These town and cities are identified flagship cities by Ministry of Housing and Urban Affairs (MoHUA) so that they could act as model for other urban centers across state to initiate city wide sanitation.